The history of Apple being doomed doesn’t necessarily repeat, but it does rhyme. Sheets of glass are simply no longer the most fertile ground for innovation. That means Apple urgently needs to shift its focus and investment to AI-driven technologies, as part of a broader effort to create the kind of ecosystem Amazon and Google are building quickly. However, Apple is falling behind in the AI race, as it remains a hardware company at its core and it has not embraced the open-source and collaborative approach that Google and Amazon are pioneering in AI. It is an entirely reasonable argument, particularly that last line: I myself have argued that Apple needs to rethink its organizational structure in order to build more competitive services. If the last ten years have shown us anything, though, it is that discounting truly great hardware — and the sort of company necessary to deliver that — is the surest way to be right in theory and wrong in reality. At that time the flagship iPhone was the iPhone 5; Apple was still only making one iPhone a year. That phone — the one that, many claimed, was the peak of hardware innovation — featured a larger (relative to previous iPhones) 4 inch LED screen, 8MP rear camera and 1.2 MP front camera, and Apple’s A6 32-bit system-on-a-chip, the first from the company that was not simply a variation on a licensed ARM design. To be sure, the relatively small screen size was a readily apparent problem: one of my first articles argued that Samsung’s focus on larger-screens was a meaningful advantage that Apple should copy. Obviously Apple eventually did just that with the iPhones 6 and 6 Plus, but screen size is hardly the only thing that changed: later that year Apple introduced the iPhone 5S, which included the A7 chip that blew away the industry by going 64-bit years ahead of schedule; Apple has enjoyed a massive performance advantage relative to the rest of the industry ever since. The iPhone 5S also included Touch ID, the first biometric authentication method that worked flawlessly at scale (and enabled Apple Pay), the usual camera improvements, as well as a new ‘M7’ motion chip that laid the groundwork for Apple’s fitness focus (and the Apple Watch). And, even as critics clamored that the pricing of the iPhone 5C, launched alongside the 5S, meant the company was going to be disrupted, the iPhone 5S sold in record numbers — just like every previous iPhone had. FaceID takes this a step further: while it takes a bit of time to change engrained habits, I’m already at the point where I simply pick up the phone and swipe up without much thought;3 authenticating in apps like 1Password is even more of a revelation — you don’t have to actually do anything. In these instances the iPhone X is reaching the very pinnacle of computing: doing a necessary job, in this case security, better than humans can.4 The fact that this case is security is particularly noteworthy: it has long been taken as a matter of fact that there is an inescapable trade-off between security and ease-of-use; TouchID made it far easier to have effective security for the vast majority of situations, and FaceID makes it invisible. While the iPod wheel may be the most memorable hardware interface in modern computing, and the mouse the most important, touch is, for obvious reasons, the most natural. That, though, only elevates the original iPhone’s single button: everything about touch interfaces needed to be invented, discovered, and figured out; it was that button that made it accessible to everyone — when in trouble, hit the button to escape. Disruptive technologies, though they initially can only be used in small markets remote from the mainstream, are disruptive because they subsequently can become fully performance-competitive within the mainstream market against established products. This happens because the pace of technological progress in products frequently exceeds the rate of performance improvement that mainstream customers demand or can absorb. As a consequence, products whose features and functionality closely match market needs today often follow a trajectory of improvement by which they overshoot mainstream market needs tomorrow. And products that seriously underperform today, relative to customer expectations in mainstream markets, may become directly performance-competitive tomorrow. The transition from proprietary architecture to open modular architecture just happens over and over again. It happened in the personal computer. Although it didn’t kill Apple’s computer business, it relegated Apple to the status of a minor player. The iPod is a proprietary integrated product, although that is becoming quite modular. You can download your music from Amazon as easily as you can from iTunes. You also see modularity organized around the Android operating system that is growing much faster than the iPhone. So I worry that modularity will do its work on Apple. Apple is — and, for at least the last 15 years, has been — focused exactly on the blind spot in the theory of low-end disruption: differentiation based on design which, while it can’t be measured, can certainly be felt by consumers who are both buyers and users. Needless to say, in 2013 we weren’t anywhere close to peak iPhone: in the quarter I wrote that article — 4Q 2013, according to Apple’s fiscal calendar, the weakest quarter of the year — the company sold 34 million iPhones; the next quarter Apple booked $58 billion in revenue. We are now four years on, and last quarter — 4Q 2017, again according to Apple’s fiscal quarter — the company sold 47 million iPhones; next quarter Apple is forecasting between $84 and $87 billion in revenue. More importantly, the experience of using an iPhone X, at least in these first few days, has that feeling: consideration, invention, and yes, as the company is fond to note, the integration of hardware and software. Look again at that GIF above: not only does Face ID depend on deep integration between the camera system, system-on-a-chip, and operating system, but the small touch of displaying notifications only when the right person is looking at them depends on one company doing everything. That still matters. Different value networks can emerge at differing distances from the original one along the third dimension of the disruption diagram. In the following discussion, we will refer to disruptions that create a new value network on the third axis as new-market disruptions. In contrast, low-end disruptions are those that attack the least-profitable and most overserved customers at the low end of the original value network. Christensen ultimately concluded that the iPhone was a new market disruptor of the PC: it was seemingly less capable yet simpler to use, and thus attracted non-consumption, and eventually gained sufficient capabilities to attract PC users as well. This is certainly true as far as it goes;5 certainly there are an order of magnitude more smartphone users than there ever were PC users. The vector of differentiation is shifting yet again, away from hardware altogether. We are on the verge of a major shift in the phone and device space, from hardware as the focus to artificial intelligence (AI) and AI-based software and agents. This means nothing short of redefinition of the personal electronics that matter most to us. As AI-driven phones like Google’s Pixel 2 and virtual agents like Amazon Echo proliferate, smart devices that understand and interact with us and offer a virtual and/or augmented reality will become a larger part of our environment. Today’s smartphones will likely recede into the background. The presumption is that the usage of Technology B necessitates no longer using Technology A; it follows, then, that once Technology B becomes more important, Technology A is doomed. In fact, though, most paradigm shifts are layered on top of what came before. The Internet was used on PCs, social networks are used alongside search engines. Granted, as I just noted, smartphones are increasingly replacing PCs, but even then most use is additive, not substitutive. In other words, there is no reason to expect that the arrival of artificial intelligence means that people will no longer care about what smartphone they use. Sure, the latter may “recede into the background” in the minds of pundits, but they will still be in consumers’ pockets for a long time to come. There’s a second error, though, that flows from this presumption of zero-summedness: it ignores the near-term business imperatives of the various parties. Google is the best example: were the company to restrict its services to its own smartphone platform the company would be financially decimated. The most attractive customers to Google’s advertisers are on the iPhone — just look at how much Google is willing to pay to acquire them6 — and while Google could in theory convince them to switch by keeping its superior services exclusive, in reality such an approach is untenable. In other words, Google is heavily incentivized to preserve the iPhone as a competitive platform in terms of Google’s own services; granted, Android is still better in terms of easy access and defaults, but the advantage is far smaller than it could be. 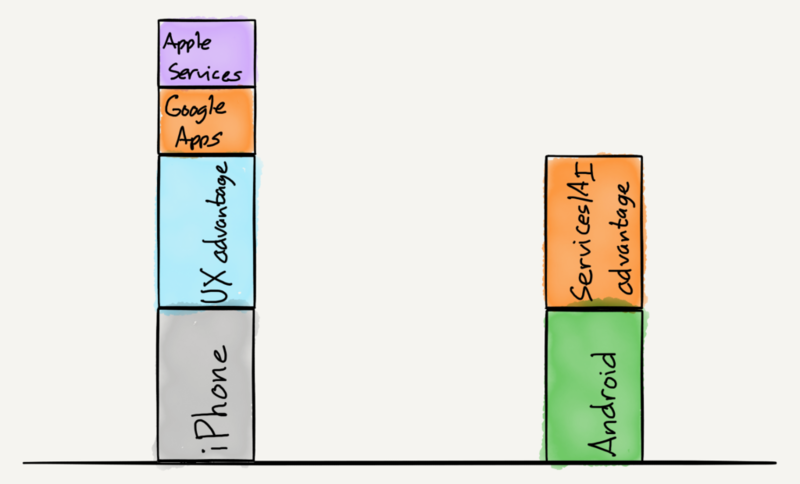 Apple, meanwhile, is busy building competing services of its own, and while it’s easy — and correct — to argue that they aren’t really competitive with Google’s, that doesn’t really matter because competition isn’t happening in a vacuum. Rather, Apple not only enjoys the cost of switching advantage inherent to all incumbents, but also is, as the iPhone X shows, maintaining if not extending the user experience advantage that comes from its integrated model. That, by extension, means that Apple’s services need only be “good enough” — there’s that phrase! — to let the company’s other strengths shine. This results in a far different picture: the “hurdle rate” for meaningful Android adoption by Apple’s customer base is far greater than the doom-sayers would have you think. I am no Apple pollyanna: I first made the argument years ago that the ultimate Apple bear case is the disappearance of hardware that you touch (which remains the case); I also complimented the company for having the courage to push towards that future. Indeed, Apple’s aggressiveness in areas like wearables and, at least from a software perspective, augmented reality, suggest the company will press its hardware advantage to get to the future before its rivals, establishing a beachhead that will be that much more difficult for superior services offerings to dislodge. Moreover, there is evidence that Google sees the value in Apple’s approach: the company’s push into hardware may in part be an attempt to find a new business model, but establishing the capabilities to compete in hardware beyond the smartphone is surely a goal as well. What is fascinating to consider is just how far might Apple go if it decided to do nothing but hardware and its associated software: if Google Assistant could be the iPhone default, why would any iPhone user even give a second thought to Android? I certainly don’t expect this to happen, but that giving away control of what seems so important might, in fact, secure Apple’s future more strongly than anything else, is the most powerful signal possible that the integration of hardware and software — and the organizational knowledge, structure, and incentives that come from that being a company’s primary business model — remains a far more durable competitive advantage than many theorists would have you think.